THE Joondalup Wolves remain the last undefeated side in the Men’s SBL after four rounds handing the Lakeside Lightning their first loss of 2019 while the 2017 champions Perth Redbacks kickstarted their campaign with their first two wins of the season. It was Friday night with the packed schedule in Round 4 of the Men’s SBL and that was highlighted by the battle of undefeated sides at Lakeside Recreation Centre between Lakeside and Joondalup. But the Wolves took care of business impressively winning 89-70. The other Friday night action saw the Willetton Tigers beat the East Perth Eagles 110-88, the Perry Lakes Hawks win big 120-73 against the Mandurah Magic, the Kalamunda Eastern Suns defeat the South West Slammers 108-88 and the Perth Redbacks beat the Rockingham Flames 96-93 for their first win of 2019. There were another four matches on Saturday night with the Goldfields Giants prevailing in a cracking contest 120-110 at Herb Graham Recreation Centre over the East Perth Eagles. The Geraldton Buccaneers beat the Cockburn Cougars 106-68, the Perth Redbacks defeated the South West Slammers 91-84 and the Warwick Senators won their home-opener of 2019 beating the Willetton Tigers 89-80. The round then concluded on Sunday with another cracker with the Rockingham Flames prevailing 96-91 over the Goldfields Giants. Four rounds into the 2019 Men’s SBL season and it’s the Joondalup Wolves out on top of the table with a perfect 5-0 record. The Geraldton Buccaneers are just behind at 4-1 while the Lakeside Lightning are now 3-1. The Goldfields Giants are looking good at 4-2 ahead of the 3-2 Rockingham Flames and Perry Lakes Hawks. The East Perth Eagles, Willetton Tigers and Kalamunda Eastern Suns are all 3-3 while the Warwick Senators are 2-2. The Perth Redbacks are now 2-4 ahead of the Mandurah Magic (1-4), Cockburn Cougars (0-4) and South West Slammers (0-5). Willetton got its double-header weekend off to a perfect start with their best performance of the season, beating the East Perth Eagles 110-88 at Willetton Basketball Stadium. The Tigers made it back-to-back wins for the first time this season following up their win over the Slammers by beating the Eagles by 22 points. Willetton were back to full strength too with Marcanvis Hymon and Jackson Hussey returning to the line-up and the result was an impressive performance by the Tigers. East Perth actually started strongly leading 21-19 by quarter-time but Willetton had assumed a 47-44 advantage by the long break. The Tigers then put their foot down in the third quarter with their best period of basketball this season with 33 points to 21 to head into three quarter-time leading 80-67. Willetton then finished the job in the last quarter to claim the 22-point victory. It was a brilliant shooting night for the Tigers who went 42/72 from the floor at 58 per cent and 12/24 at 50 per cent from three-point range. Sharing the ball was their order of the night with 34 assists on the 42 made field goals. East Perth didn’t shoot badly or play that bad themselves going at 47 per cent from the field and 33 per cent from downtown, but Willetton was simply on fire. Jackson Hussey was superb for the Tigers with 30 points, seven assists and four rebounds with his long-time teammate Mo Barrow finishing with 23 points, 10 rebounds and five assists. Damien Scott added 14 points, eight assists, six rebounds and five steals for Willetton with Michael Garbellini contributing 11 points, Marcanvis Hymon 10 points, seven rebounds and two assists, and Scott Elder eight points and seven rebounds. Sunday Dech top-scored for East Perth with 22 points, four rebounds, four assists and four steals in just 24:30 of court time. Cameron Williams added 18 points and three assists for the Eagles, Jordan Wellsteed 12 points, Aiden Murphy 10 points, six rebounds, four assists and two steals, and Andrej Donlagic eight points, four assists, three boards and three blocked shots. The Perry Lakes Hawks backed up their first two wins of the season in Round 3 by starting Round 4 on Friday night with a 120-73 thumping of the Mandurah Magic. The Hawks lost the opening two games of their championship defence to Joondalup and Rockingham, but bounced back strongly last weekend with two wins inside 18 hours over the Redbacks and Buccaneers. 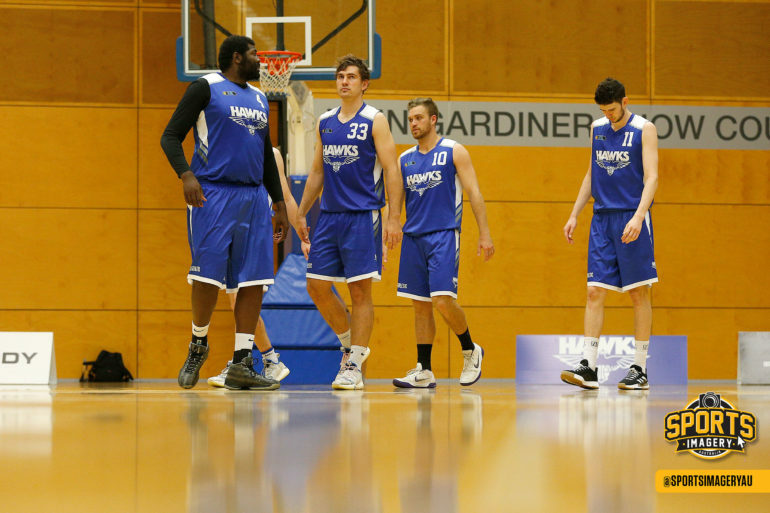 They backed that up on Friday night at Bendat Basketball Centre with an eventual 47-point win against the Magic. Perry Lakes came out strongly with 30 points to 11 in the first quarter and continued to extend their advantage the rest of the way to lead by 27 points at half-time, 46 points at three quarter-time and then to end up winning 120-73. The win improves the Hawks to 3-2 on the season with momentum building while the Magic are 1-4. Worrying after their win at Kalamunda, Mandurah has lost its past two matches to East Perth and Perry Lakes by a combined 98 points. The Hawks had a brilliant all-round game shooting 41/76 at 53 per cent from the field, 20/41 at 48 per cent from three-point range and 18/19 at 94 per cent from the foul line to go with 50 rebounds, 35 assists and just 13 turnovers to lead by as much as 56 points before winning by 47.
Cooper Hamilton had a career night for the Hawks after sitting out last Sunday’s win over Geraldton. He had 28 points and two assists on shooting 11/17 from the floor and 5/11 from downtown. Newly re-signed Perth Wildcats NBL championship winner Clint Steindl put up 20 points and three assists too, going 4/7 from deep. Lochlan Cummings added 14 points in just 11 minutes for the Hawks while hitting 3/5 from three-point range with Ryan Smith adding 13 points, five rebounds and four assists, Mitch Clarke 13 points, three rebounds and three assists, and Ben Purser 10 points, 11 assists and 10 rebounds for the triple-double. Shaun Stewart top-scored for Mandurah with 18 points, eight rebounds, three assists and two steals with fellow import Marvin Smith adding 14 points and four rebounds, and Akau Deng eight points, five boards and two blocked shots. Kalamunda and South West both needed a response when they met at Ray Owen Sports Centre on Friday night, but only one would get what they were after and it was the Eastern Suns who prevailed 108-88. It’s been a rollercoaster start to the season for the Suns under new coach Mark Utley and that was on show last weekend. It started with a 26-point win over Willetton and finished with a 29-point loss at home to Geraldton. Meanwhile, it’s been a tough start for coach John Triscari at the Slammers losing their opening three games to the Eagles, Buccaneers and the Tigers. So that set up a fascinating battle on Friday night but Kalamunda worked its way on top early to lead 28-22 by quarter-time and then to be on top 61-46 by half-time. The Slammers did mount a comeback in the third quarter and by holding the Eastern Suns to just eight points, they were able to tie scores up by three quarter-time. But it was all the Suns in the fourth term with the home team racking up 39 points to 19 to win by those 20 points and improve to 3-3 while the Slammers are 0-4. It was a terrific shooting performance from the Eastern Suns as they went 38/72 at 52 per cent from the floor and 14/31 at 45 per cent from three-point range. Louis Timms had his second straight monster Friday night performance delivering 35 points, nine rebounds and two blocked shots while shooting 15/24 from the field and 5/8 from three-point territory. Josh Braun wasn’t far behind in the impressing stakes with 32 points, 11 rebounds, eight assists and three blocks while going 9/18 from the floor, 3/5 from beyond the arc and 11/13 at the charity stripe. Carl Aylett had a career-best night too for Kalamunda with 24 points, four rebounds and three assists including hitting 4/5 of his three-point attempts. Michael Lay top-scored for the Slammers with 26 points, four rebounds, four steals and two assists while Tyler Livingston contributed 16 points and three boards, Brian Voelkel 14 points, 13 assists and 11 rebounds for another triple-double in his burgeoning SBL career. Chris Douglas also scored 12 points to go with three rebounds. All eyes were on Lakeside Recreation Centre for the battle between the last two undefeated teams in the Men’s SBL on Friday night and it was the Joondalup Wolves that remained that way coming away with the 89-70 victory over the Lakeside Lightning. The Wolfpack were on song from the outset and ready to make a statement having already been impressive and dominant to start the season with wins against Perry Lakes, Goldfields, Warwick and East Perth coming into the weekend. Lakeside, too, despite not yet having Michael Vigor and Jack Isenbarger had looked good in wins over the Magic, Tigers and Redbacks, but couldn’t quite keep it going at home to Joondalup on Friday night. The Wolfpack managed to open up a 24-21 lead by quarter-time which they extended to 46-37 by half-time. They then dominated the third quarter holding the Lightning to just 13 points and went on to cruise to the 19-point victory having at one stage led by 24 points. Ridell Camidge was impressive for the Wolves finishing the game with 24 points, four rebounds and two assists with Earnest Ross contributing 19 points, 10 rebounds and five assists. Camidge hit 7/12 from three-point territory and Ross 3/8. Kevin Davis also had 10 points, 10 rebounds, four assists and three blocked shots for the Wolfpack while Rob Huntington contributed eight points, three rebounds and three blocked shots, and Reece Maxwell seven points, five rebounds and two steals. Lakeside’s night certainly wasn’t helped with the loss of Jarrad Prue after he managed just six minutes on the floor. He already had four points, three rebounds and a steal in that time. Josh Davey top-scored for the Lightning with 16 points and 13 rebounds while Ben Lee added 13 points, Jobi Wall 13 points and four assists, Rowan Mackenzie 13 points, four rebounds and three assists, and Liam Hislop 11 points, five rebounds and three steals. The Perth Redbacks were winless and hosting a Rockingham Flames that was building into the season nicely, but it was the champions of 2017 who got their opening victory of the season 96-93 at Belmont Oasis. It had been a tough opening to the season for the Redbacks losing to the Senators, Giants, Lightning and Hawks while having Kyle Bowen for just one game and Jourdan DeMuynck and Lee Roberts not at all. That was on top of losing Shawn Redhage, Michael Vigor, Jackson Hussey, Mo Barrow and Ben Smith in the off-season, but they responded impressively against the Flames on Friday. Rockingham was coming off big wins against Cockburn and Perry Lakes, but the Redbacks did well on their home floor to come away with the thrilling three-point win. Nothing more than seven points separated the teams all night and it was always destined to go down to the wire. The Redbacks led 67-66 at three quarter-time before Marshall Nelson put them up by four with a three. That grew to five after a Jayden Coburn three-point play but the Flames weren’t backing off and were soon level again when young gun Luke Travers hit a triple. Lachlan Forrest responded in kind for Perth before Coburn got to the rim to make it a five-point Redbacks advantage. But with five minutes to go, Rockingham had drawn back to level terms before Coburn again had the answers for the home team, this time hitting from beyond the arc. But Greg Hire responded with the and-one play with scores again all square. Nelson broke the deadlock with a step back jumper showing his growing confidence before Coburn and Forrest combined for five points as the Redbacks led 94-89 with two minutes left. They would do enough to win by three with Ritchart and Travers both missing attempts to tie scores at the end. Jayden Coburn had his best performance since joining the Redbacks this season with 24 points, four rebounds and three assists on shooting 10/17 from the field and 3/6 from deep. Marshall Nelson had 24 points, eight assists and three rebounds too for Perth with Zac Gattorna contributing 20 points, four rebounds and four assists, Majier Garang 13 points and seven boards, and Joel Wagner seven points, seven assists, three steals and two rebounds. Greg Hire had another huge performance for Rockingham made up of 30 points, 14 rebounds and six assists with Josh Ritchart adding 20 points and four boards, and Chudier Pal 18 points, 10 rebounds, four assists and two blocked shots. East Perth and Goldfields came into Saturday night’s clash at Herb Graham Recreation Centre ready to to put on a tremendous show with the Giants ending up prevailing 120-110. The Eagles came into the game at 3-2 with their only loss coming into this round against the undefeated Wolves while having beaten the Slammers, Cougars and Magic. But they then lost by 22 at Willetton on Friday. The Giants lost first up on the road in 2019 to the Wolfpack too but have since beaten the Flames, Redbacks and Senators setting the stage for Saturday night’s clash with the Eagles. It certainly didn’t disappoint with a high quality affair seeing the teams combine for 130 points with the Giants shooting at 49 per cent from the field and 45 per cent from deep while the Eagles went at 45 per cent from the floor and 35 per cent from beyond the arc. Goldfields ended up pulling in 55 rebounds to East Perth’s 44 while having 32 assists on those 39 field goals. But the Eagles did force the Giants into 22 turnovers from which they scored 26 points. East Perth was without coach Adam Forde along with Sunday Dech due to the Perth Wildcats MVP Ball. East Perth also had 54 points in the paint to 52 so it was a high-quality affair in a lot of ways, but the Giants started strongly with 32 points to 15 in the first quarter. Goldfields would go on to lead by as much as 21 points before then resisting East Perth’s 68 second half points to hold on for the 10-point victory while still scoring 60 after half-time themselves. Jay Bowie was outstanding for the Giants with 36 points, nine rebounds, five steals and two assists on shooting 12/20 from the field, 4/8 from downtown and 8/10 from the foul line. Patrick Burke added 19 points, six rebounds and two steals for Goldfields while Manylok Malek contributed 19 points, 12 rebounds and five blocked shots, Jerome Reid 16 points and seven boards, David Humphries 10 points, six boards and five assists, and Brandon Holloway nine points, 10 assists, six rebounds and two steals. Cameron Williams had a big night for East Perth made up of 28 points, three rebounds, two assists and two steals including hitting 4/8 from three-point territory. Andrej Donlagic added 18 points for the Eagles, Drew Williamson 16 points, four rebounds and three steals, Aiden Murphy 16 points, four assists, three steals and three boards, and Jordan Wellsteed 13 points, eight boards, five assists and five steals. The Geraldton Buccaneers returned home after suffering their first loss of the season and took out that frustration on the Cockburn Cougars on Saturday night, winning 107-68. The Buccs started their season with home wins against the Flames and Slammers before winning their first road game of 2019 last Saturday night against Kalamunda. But they couldn’t keep it going last Sunday losing to the defending champion Hawks ahead of hosting a Cockburn team at Active West Stadium on Saturday night yet to win a game in 2019. That wasn’t to change in Geraldton on Saturday night with the Buccs on top from early on, leading 25-18 by quarter-time. The Buccaneers continued to extend that advantage to lead by 12 points at half-time, 26 by three quarter-time and to end up winning by 39. Marcus Alipate ended up top-scoring for the Buccs with 23 points, eight rebounds and six assists while Colter Lasher added 16 points and six boards. Liam Hunt also had 15 points and eight rebounds for Geraldton, Willie Conner 14 points, five boards, three steals and two assists, Brayden Inger 12 points, four rebounds, four steals and two assists, and Matt Wundenberg 10 points and 11 boards. Cockburn’s hopes of a first win of 2019 weren’t helped with inspirational captain Gavin Field limited to 11 minutes for four points and two rebounds. Jaarod Holmes top-scored for the Cougars with 19 points and four rebounds with Steven Van Lit adding 13 points and eight rebounds, and Seva Chan 10 points, three steals and two boards. The South West Slammers had another attempt at their first win of 2019 on Saturday night but it was the Perth Redbacks who made it a perfect weekend with the 91-84 victory. Both teams came into the weekend winless so far this season and both had also played on Friday night with the Slammers losing to the Eastern Suns while the Redbacks got on the board beating the Flames. It was the Slammers playing host at Eaton Recreation Centre but with just 27 first half points, they had their job ahead of them with the Redbacks leading by eight at half-time. The Redbacks then stamped their authority in the third quarter with 34 points to 18 to lead 69-45 at three quarter-time. Despite the Slammers putting up 39 points in the fourth quarter, as impressive as it was, they never quite threatened the Redbacks who improved to 2-4 while the Slammers are now 0-5. Marshall Nelson continued to step up to be a dominant presence for the Redbacks with another 25 points, nine rebounds and five assists on shooting 9/17 from the floor and 3/7 from three-point range. Zac Gattorna has taken his game up another level so far in 2019 as well for Perth and had 16 points, seven rebounds, three assists and two blocked shots while Joel Wagner contributed 14 points and seven assists, Majier Garang 11 points and nine boards, Jayden Coburn 10 points and David Swaby 10 points and three rebounds. Brian Voelkel had yet another triple-double for the Slammers made up of 10 points, 15 rebound and 13 assists with Tyler Livingston putting up 37 points and 12 rebounds. Brody England also had 14 points and three rebounds for South West and Michael Lay 10 points, five rebounds, four steals and three assists. The Warwick Senators played their first home game of the season at Warwick Stadium on Saturday night and came away with an 89-80 victory over the Willetton Tigers. The Senators opened the new season with a road win over the Redbacks before losing to the Wolves and Giants away from home too leading into their first home appearance of 2019 in Round 4 on Saturday night. It was their only game of the weekend too while the Tigers had already played on Friday night and beaten the East Perth Eagles impressively by 22 points. Willetton built on that momentum to start strongly and lead 25-21 by quarter-time, but Warwick had turned that around with 25 points to 16 in the second term to lead 46-41 at half-time. It remained a close run thing throughout the second half but in the end the Senators did enough to come away with the nine-point win for their second victory of the season. Caleb Davis top-scored for the Senators with 25 points, seven rebounds and three assists with Justin King contributing 23 points, 10 rebounds and three assists. Ngor Manyang contributed 12 points and five rebounds off the bench for Warwick with Ash Litterick also finishing with 10 points, four rebounds, two steals and two blocked shots, and Cody Ellis 10 points, seven assists, five steals and three rebounds. Willetton couldn’t quite back up its strong Friday night win over East Perth despite 36 points, seven rebounds, three steals and two assists from captain Damien Scott. Mo Barrow ended up with 14 points, four rebounds and three assists for the Tigers, and Jackson Hussey 11 points, five steals, three rebounds and two assists. Round 4 in the Men’s SBL concluded with a lone Sunday fixture that saw the Rockingham Flames bounce back to beat the Goldfields Giants 96-91. Rockingham had lost to the Perth Redbacks at Belmont Oasis by three points on Friday night while Goldfields had continued its impressive form with a 10-point road win over East Perth on Saturday night. It was always going to be a fascinating battle on Sunday at Mike Barnett Sports Complex with both teams keen to make an early season statement. The Giants did pull away during the second quarter with 32 points to 25 to lead 50-44 at half-time, but Rockingham closed the gap in the third quarter to cut Goldfields lead to one heading into the fourth. Jarryd Griffin then put Rockingham in front when he hit a three. He nailed a second soon after, but the Giants soon regained the lead thanks to Jay Bowie. A three from Bowie put the Giants up four with 5:45 remaining but a minute later Justin Beard made the scores level when he nailed on from downtown too. The Flames then worked their way on top with a Luke Travers three ball and Caleb White layup. Another three from Justin Beard and they led by five, then by eight with another triple from Ryan Godfrey and they were able to secure the five-point victory. Caleb White top-scored for a Rockingham team that was without Greg Hire. White finished with 21 points, three rebounds and two assists with Josh Ritchart contributing 19 points and three rebounds. Luke Travers had another 16 points, six rebounds, five assists, two steals and two blocked shots with Ryan Godfrey contributing 11 points, eight assists, six rebounds and two steals, Justin Beard 10 points and 11 boards, and Chudier Pal nine points, eight boards and three blocks. It was just the second loss of the season for the Giants, both on the road, despite Jay Bowie producing another 25 points, 10 rebounds, four assists and two steals. David Humphries also finished with seven rebounds, six steals and five assists, and Patrick Burke 23 points and five boards.